The director of the DCU GAA Academy has paid testament to Niall Moyna and his management team for their role in DCU’s Sigerson Cup success last week, saying they got everything “100 percent right”. 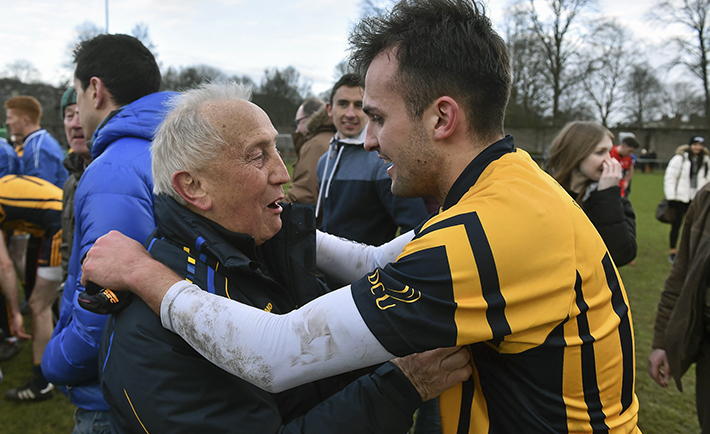 Michael Kennedy was present at The Mardyke Arena on Saturday to see his students battle past UCC in extra-time to claim the Glasnevin university’s third Sigerson Cup in six years and says the atmosphere afterwards was euphoric. “I suppose there was total euphoria at the fact that it went to such a nail-biting finish. It was an incredible feeling. Kennedy was quick to praise the coaching staff of Niall Moyna and the new addition of former Meath manager Seán Boylan who did a sterling job in getting the players over the line after four tough games all away from home. With an opening round game in Belfast against UUJ, followed by another trip to Belfast for a quarter-final tie with St Mary’s, before the final two games taking place in Cork, the DCU panel clocked up a significant number of miles on their travels but Kennedy feels that that was a benefit to the squad. “It was tough that the players had to play away for every game. [The UUJ game] gave the player such confidence but also brought such great belief into the squad. Going up Belfast and beating UUJ and beating St Mary’s on extra time instilled such great belief. They knew that even if they went behind they could come back and win. They never lost faith and they never lost belief in themselves as a squad. “For any team to spend time together when they’re travelling, that creates a real bond. Within a team environment when they’re on the bus or sitting down having meals they’re always becoming closer together. So from our perspective they gained great experience from that and became so united as a group,” he said. Former Brisbane Lions Aussie Rules player Colm Begley was a huge asset to the DCU panel this year and brought some much-needed experience to a young squad. Kennedy felt that Begley’s influence was particularly important in DCU’s success.